At PLAN, we know the importance of being connected in caring, supportive relationships, especially ones that are unpaid. In his recent Empowering Ability Podcast, Eric Goll featured a discussion with Rebecca Pauls, the Director of PLAN, on the topic of how we build and maintain Personal Support Networks, and how being together in relationships is the foundation for a good life. We are pleased to share the Podcast with you. There is also a written synopsis for you below. In this episode, you will learn all about Personal Support Networks! You might have heard of support circles, circles, microboards, or aroha’s (there are probably names I’m missing), but theses are all forms of Personal Support Networks. 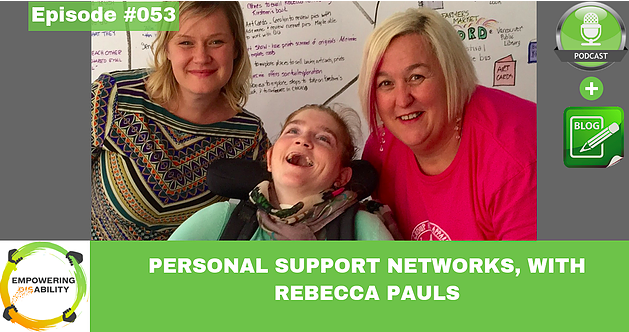 Rebecca Pauls, Director of Planned Lifetime Advocacy Network (PLAN), shares with us with us what a Personal Support Network is, how they can benefit you, and how to go about building one. One of PLAN’s ultimate aims is to create a Good life for families, which includes; Friends and relationships, making a contribution, being empowered to make choices, a place to call home, financial stability, parents have peace of mind. The basis of all of these things is to have people and relationships to do life together with. One of the main tools used at PLAN to accomplish this is personal support networks. What is a Personal Support Network? What is the Purpose of a Personal Support Network? To ensure that no one is alone or so no one is stuck in isolation. Sometimes we hear the saying that loneliness is the only debilitating disability. A personal support network is to ensure that everyone can live in an inclusive community. There are all sorts of things people in the network can do together and accomplish. At the heart of it is recognizing that we have the support that we need to live the life that we want and dream of for ourselves. What are you seeing for people with Disabilities that have an intentional personal support network, vs those who do not? “I think the difference comes in when the unpaid relational support is involved. When there isn’t a personal support network they might live a life where they don’t have friends. When a personal support network is involved and parents aren’t able to be involved, there are people that are there to play important and specific roles. At PLAN we have mentors to support families with building and maintaining these Personal Support Networks. In different times in a person’s life, they might depend on a person’s personal support network in different ways. When they are a young person or things are going well they might do more fun and social things. At different points in life when challenging situations come up, or there is a need for planning and advocacy it might be more formal. You can often hear these networks being called natural supports, or circle of support, or microboard (which is the most formal way of setting up a personal support network). The most important thing is not what you call it, but in the way that people are working together. It is important not only for people with disabilities, but it is more like a way of being, and a way of living our lives. It is sometimes difficult to build or maintain those personal networks. PLAN has a community connector or mentors to help keep everyone connected. How does someone build a personal support network? “We start by getting to know who the person is, their gifts, what they think about, what they like to do, and the things that they care about. We build relationships based on common interests. When we build the network we focus on gifts and the uniqueness of each person. Then we think of who are all of the people in your life and build a relationship map. If there aren’t a lot of people in your life we think about if you did have people in your life, what roles would they play? Then we look to the community. We believe that our communities are full of welcoming places and other people with gifts. When we look to build the connections we look for groups that are already in place. The role of the community connector is to create opportunities for the person to get connected. Turning those relationships into a network is a matter of talking about what is important. We encourage people to share what is important in their life right now. The community connector can help to create the opportunities for people together. As we reach a time where a generational shift is happening, the parents that created inclusion across the country are reaching their 70’s the rubber is hitting the road in terms of these networks and transition. Who plays the community connector role? “Sometimes there is a natural connector in a person’s life. In other situations, the family might hire someone to play that role (Like the service PLAN offers). Some organizations train their personal support workers to take a network approach. The supporter will ask the question, who else can we involve? What do personal support network meetings look like? On the podcast, Rebecca gives examples of what support networks and roles people play in a support network can look like. What are you currently learning at PLAN? PLAN has also developed a new planning tool that works to answer the question, do families have peace of mind? This is an interesting question because peace of mind is dynamic and it changes. This new planning tool helps families to understand if they have peace of mind in the different areas of life, and it helps families to think about what they need to do to get there. Listen to the podcast to learn more about this thinking that Rebecca shares.